three from Yorkshire, another of unknown origin. 600 KB download in 3 minutes at 28800 bps. 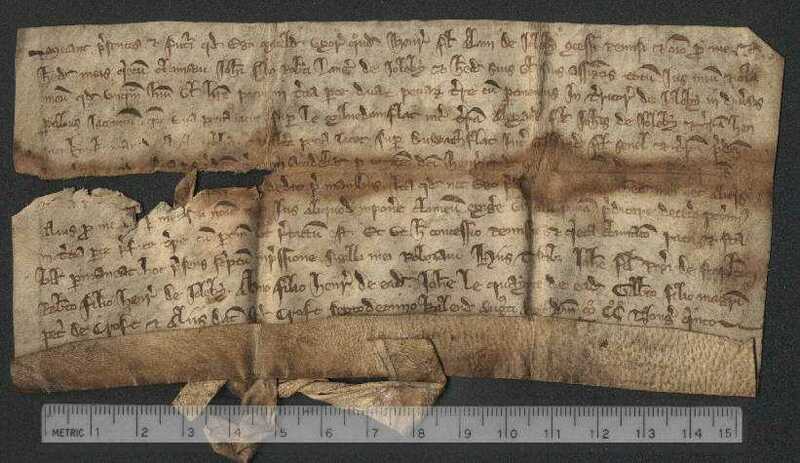 Charter of Matilda, wife of the late Hendry Fitz Alan of Jolby, granting to John, son of Robert Langen [Langer?] of Jolby and his heirs and assigns, all right and claim in the third part of two pieces of land in Jolby. One piece lies on le Milnedam (sic) flat between the land of Alexander FitzJohn of Jolby and that of Henry Kyrkeman of Halnaby, and the other lies on DuWath [?] flat between Geoffrey Fitz Senel [Lenel?] and the aforesaid [... ms torn and discoloured]. 17 July 1295. 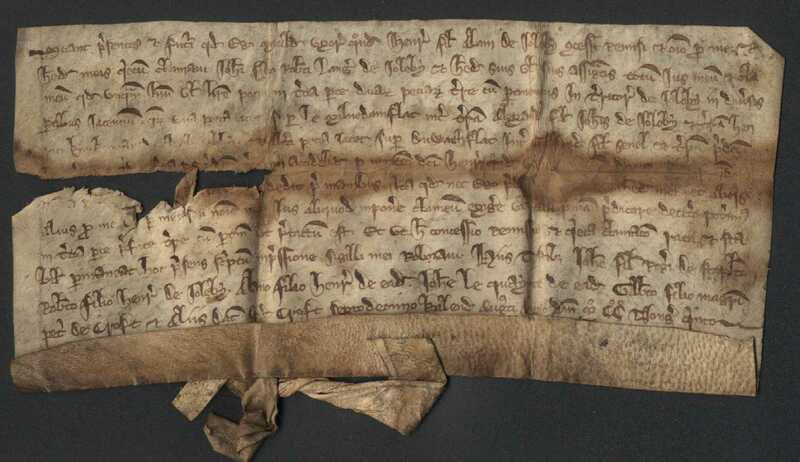 Charter of Margaret, daughter of Henry the Reeve, widow, granting to John de Oxhendale, one acre of land in Jolby, namely on rood at Rogerpites & [8?] a half,, & [8?] at Depmire half a rood & in le Flasckes [?] one rood & a half, & one acre at le Merdit, one rood & a half at le Millendame (sic) flat, one rood of meadow in Dyyat (sic), & one acre of land, one rood in another place, namely 3 roods abutting on the moor, & at Smertonmire half an acre. Let men present and future know that I, Robert Brandson of Blackwell, have given, granted, and by this my present charter confirmed, to Robert Playce and his heirs, 2 strips of ploughland, and half a strip of ploughland on le Hirdgailethorne, a broad strip of ploughland on le [blank], and a short broad strip of ploughland in le Flasch, with their appurtenances, in the town and district of Jolby, lying near the land which the said Robert Playce acquired from John Peresson of Croft, my partner. To have and hold all my aforesaid lands and tenements in Jolby, together with all the other lands and tenements with I have in the aforesaid town of Jolby, to the aforesaid Robert Playce, his heirs and assigns, of the chief lords of that fee, by the services due and by right accustomed therefor for ever. And I indeed, the aforesaid Robert Brandson, and my heirs, will warrant and defend all my aforesaid lands and tenements with their appurtenances in the aforesaid town of Jolby, to the aforesaid Roberty Playce, his heirs and assigns, against all men for ever, by the presents. In testimony of which I have appended my seal to this my present charter. These are witnesses: Henry Brotherwik, Hugh Maunsell, John Blakman, junior, John Jacson, son of John Jacson, Robert Dak, William Ellerbek, and others. Given at Halnaby on Wednesday next after the feast of the Lord's Epiphany in the 9th year of the reign of King Henry V after the conquest of England. 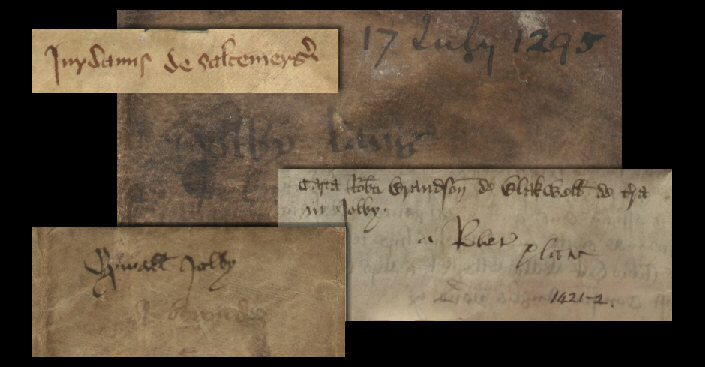 [7 January 1422]. Scans, transcriptions supplied by and copyright of Deanna Fowler.